During an experiment carried out at GANIL in Caen (France), an international team, led by researchers from Irfu and the University of Oslo, studied the shape of the Zirconium-98 nucleus. The shape of a nucleus corresponds to the area where its protons and neutrons can be found. Understanding it means mastering the behaviour of each proton/neutron and their arrangement related to the nuclear force. The objective was to determine the shape of the nucleus in different excited states. The results give a complex scenario, for which three different shapes - spherical, slightly deformed and strongly deformed - coexist within the same nucleus depending on whether it is in its ground or excited state. In addition, its neighbouring nucleus, Zirconium-100 with only two more neutrons, behaves in the opposite way. This sudden change in the shape of these two isotopes is a rare phenomenon that strongly constrains nuclear structure models. These results have been published recently in Physical Review Letters . Fig. 1: The EXOGAM spectrometer (right, on the blue platform) coupled to the VAMOS spectrometer (left). Depending on the number of protons and neutrons that compose it, the nucleus can take different shapes: spherical, elongated like a cigar or flattened like a lens. Usually, the shape of a nucleus evolves smoothly with the proton and neutron numbers, and much work has already been invested to map these evolutions along the nuclear chart. Nuclei composed of about 40 protons and 60 neutrons are of particular interest because indications for a more abrupt change in shape have been obtained. Normally, the nucleus exists in its ground state (which is the most energetically favourable, the most stable state), but it can also be produced in excited states; in this case, it can de-excite by emitting gamma radiation, i.e. photons, to reach its ground state. 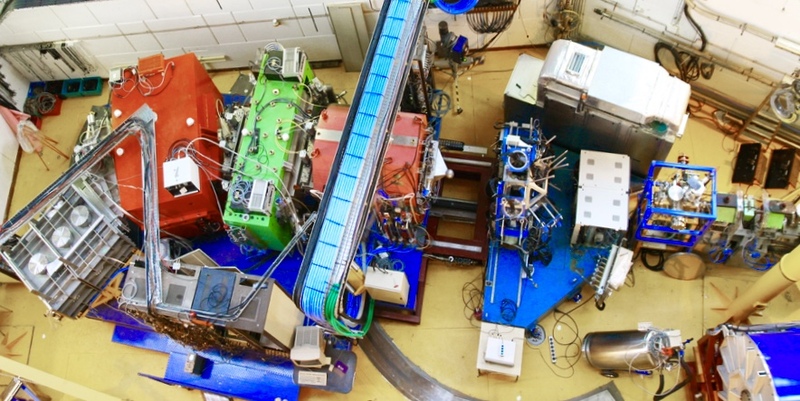 By studying the nucleus of Zirconium-98, produced during an experiment at GANIL, the researchers wanted to study its shape by measuring the lifetime of the different excited states. This experiment required the state-of-the-art detection systems available at GANIL (see Fig 1): the VAMOS spectrometer to identify the nuclei produced in the reaction and the EXOGAM detector to measure the gamma rays from the excited states in order to study their lifetime (in the range of picoseconds), which allows to deduce information about their shape. Fig. 2: Representation of three excited states of the Zirconium-98 nucleus. For this isotope, the higher the excitation energy, the more the nucleus is deformed. 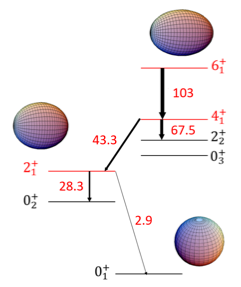 The results show the coexistence of three shapes within Zirconium-98: spherical when in its ground state, slightly deformed at low excitation energy and strongly deformed at higher excitation energy (Fig. 2). By comparing these observations with known shapes of Zirconium-100 (which has only two more neutrons), the researchers were able to deduce that the shape transition between these two isotopes of Zirconium was sudden, a rare phenomenon. They also noted an inversion of the shape of these nuclei in their ground and excited states: Zirconium-98 is spherical in its ground state and deformed when excited. For Zirconium-100, it is the opposite. This inversion explains the extreme change in the shape of the ground states of these nuclei. These observations reveal the underlying structure of the nucleus, providing new constraints for state-of-the-art nuclear structure models which, with the exception of the Monte Carlo Shell Model, predicted smooth changes in the shape of the nucleus. The results have been published in Physical Review Letters on November 9th 2018 .